For at least the last two decades, there have been calls within the United Nations to develop robust, accurate, and effective early warning systems for conflict prevention. Indeed, as recently as September 2011, Secretary-General Ban Ki-moon and the UN Security Council reiterated this need in their report “Preventative Diplomacy: Delivering Results.” The president of the Security Council at the time stated that a “key component…of a comprehensive conflict prevention strategy include[s] early warning [mechanisms].” The need for comprehensive early warning systems to analyze and disseminate data on sociopolitical and armed conflict dynamics within the UN system is well established. One way to overcome these resource constraints is to create tools that can automate the processing and analysis of quantitative data. Machine learning and data science seems a natural fit to improve this process. Data science is a multidisciplinary field that applies a mix of mathematics, statistics, computer science, data modeling and visualization, graphic design and hacking, as well as specific subject area expertise. Machine learning is a branch of computer science that leverages algorithms, or a set of step-by-step computer procedures, to perform actions without explicitly being programmed to. Machine learning has been used by a wide variety of private sector organizations for things like targeting user recommendations, detecting fraud and identity theft, and ad optimization. 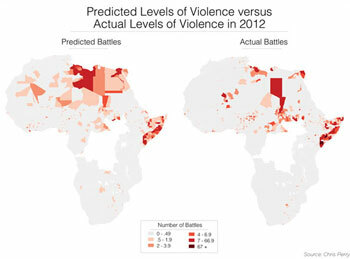 Yet there are relatively few examples of systematic attempts to create open source tools to forecast violent conflict. Instead, existing efforts to use statistical forecasting are 1) classified, 2) proprietary and very expensive, or 3) rudimentary, often relying heavily on data of violent occurrences as the primary source of information about trends in violence. Classified data can only be used by NGOs and IOs on a need-to-know basis. The costs of proprietary systems are often prohibitive to IOs and especially to NGOs. The first stage focused on two main aspects: feasibility and added value. First, what are the necessary systems for a feasible technology-based early warning tool? Can these systems be automated so as to make the tool workable, and, if so, what is the process? Is there a way to integrate a variety of types of data into the system? Our initial results were promising. We developed a framework that aggregates a variety of sources at the subnational level and tries to predict outbreaks in violence. This sub-national unit of observation is an important step. It is relatively easy to say with a reasonable amount of certitude that the Democratic Republic of the Congo or Somalia will experience conflict in the coming year based on knowledge that those countries have experienced high levels of violence in the recent past. It is much harder, and potentially much more useful, to be able to pinpoint the specific areas in a country that are likely to experience conflict. 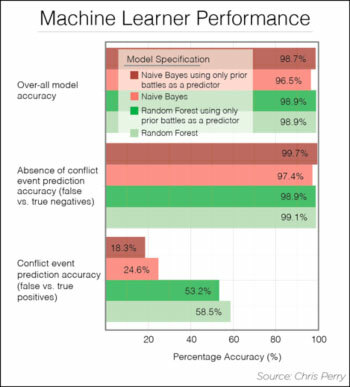 We also found that the application of a machine-learning algorithm improved our predictive accuracy. 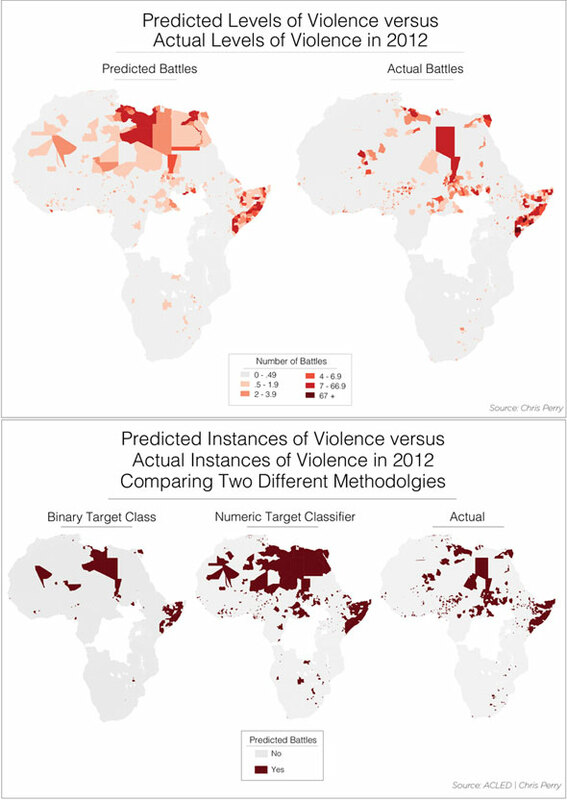 One of the problems with trying to predict outbreaks of violence is that violent events are very rare relative to the larger data set. Because of that, there is very little variation in overall accuracy, either due to algorithm choice or due to use of additional data. Indeed, using the full data1 over the baseline of only previous conflict offered a modest but promising 10-30% increase in accuracy. While this may seem less than groundbreaking, the input data was selected primarily for ease of use in the test model. Machine learning is an iterative process, and future iterations will focus on selecting better input data. As a final “sanity check”, the models were applied to 2012 data, which was initially partitioned from the rest of the dataset. The predictions were then mapped against actual instances to give a visual representation of the accuracy of the models. These maps give a good visual representation of the geographically accuracy of both learners. Probably the most promising result is that while the models tend to over-predict; they do not do so randomly. Over-prediction values tend to be geographically clustered in the “right” place. The full predictor data we used included raster data (a land conflict index, flood and drought frequency, percentage of children under five years of age that are underweight, infant mortality rate, GDP of the current and previous two years, change in GDP, and the population for the current year and the previous two years), GIS vector data (ethnic composition and petroleum resources), GIS point-data (lootable diamond deposits and conflict events), and national and subnational governance data. Chris Perry is a Senior Policy Analyst at the International Peace Institute. He tweets at @cperry1848.